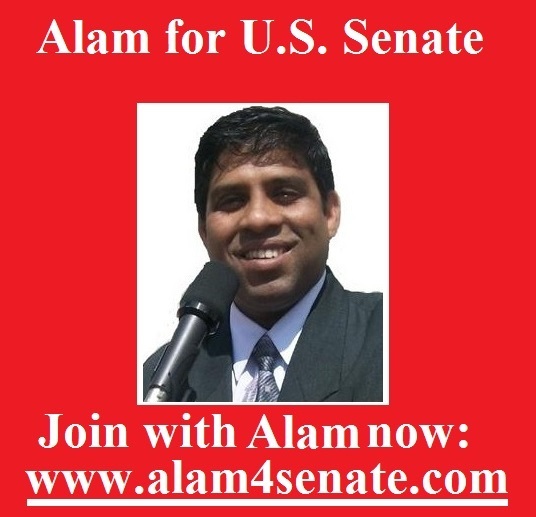 On March 11, 2016 MD Alam anounced backing out of U.S. Senate race and merged his campaign in to the Missouri Secretary of State race. "It's time now. Because of the need of the party, demand of the Community and the viability of a winning successful campaign in 2016 let us create the momentum of merging campaign of ‪#‎MissouriSecretaryOfState2016‬ now." According to the decision of our leaderships, delegates, surrogates, activists and supporters of ‪#‎MDPAAC‬, ‪#‎AMPAC‬, ‪#‎NDPAAC‬ and ‪#‎DNBC‬ HEREBY DECLARING MY RACE FOR ‪#‎MOSOS‬ AND WE ARE ‪#‎CeaseFiring‬ our Campaign for ‪#‎Senate2016‬. I am glad that the community took the required decision and let's make a successful blue ‪#‎Missouri‬ year of 2016 with the success of ‪#‎ChrisKoster‬ ‪#‎JasonKander‬ ‪#‎RussCharnahan‬ ‪#‎JudyBaker‬, ‪#‎JakeZimmerman‬ and ‪#‎MDALAM‬. Thank you all for your hard work and for your continuous support. On May 18, 2015 our campaign for U.S. Senate race https://www.youtube.com/watch?v=VEbQvtgNA0o" target="_blank">#Alam4Senat 2016 was officilly announced. As of today March 11, 2016 "Alam for senate race 2016" has been ended. MD Alam is backing out of the senate race and endorsing https://www.jasonkander.com/" target="_blank">Jason Kander (D - MO) for U.S. Senate race. On February 8, 2016 Alam's campaign announced the endorsemnt for Vermont Senator Bernie Sanders for 2016 white house bid. MD Alam is running for United States Senate and endorsing Bernie Sanders for his presidential bid in 2016. Alam a Bangladeshi born Muslim American who is the founder of American Mulsim Political Action Committee (AMPAC) and he is the former national Chair for U.S. National Democratic Party Asian American Caucus (NDPAAC). Alam also founded Missouri Democratic Party Asian American Caucus (MDPAAC). Alam said as a Muslim American he is very proud to support and endorse Bernie Sanders a Jewsih American to be the first Jewsih American president. Alam and the AMPAC is happy and proud to bring victory for senator Sanders. Alam's campaign also sets up the headquarters for Sanders "Muslims for Bernie Sanders" in Kansas City.